The findings are said to be the first time vulnerabilities have affected both 4G and the incoming 5G standard, which promises faster speeds and better security, particularly against law enforcement use of cell site simulators, known as “stingrays.” But the researchers say that their new attacks can defeat newer protections that were believed to make it more difficult to snoop on phone users. “Any person with a little knowledge of cellular paging protocols can carry out this attack,” said Syed Rafiul Hussain, one of the co-authors of the paper, told TechCrunch in an email. Hussain, along with Ninghui Li and Elisa Bertino at Purdue University, and Mitziu Echeverria and Omar Chowdhury at the University of Iowa are set to reveal their findings at the Network and Distributed System Security Symposium in San Diego on Tuesday. The paper, seen by TechCrunch prior to the talk, details the attacks: the first is Torpedo, which exploits a weakness in the paging protocol that carriers use to notify a phone before a call or text message comes through. The researchers found that several phone calls placed and cancelled in a short period can trigger a paging message without alerting the target device to an incoming call, which an attacker can use to track a victim’s location. 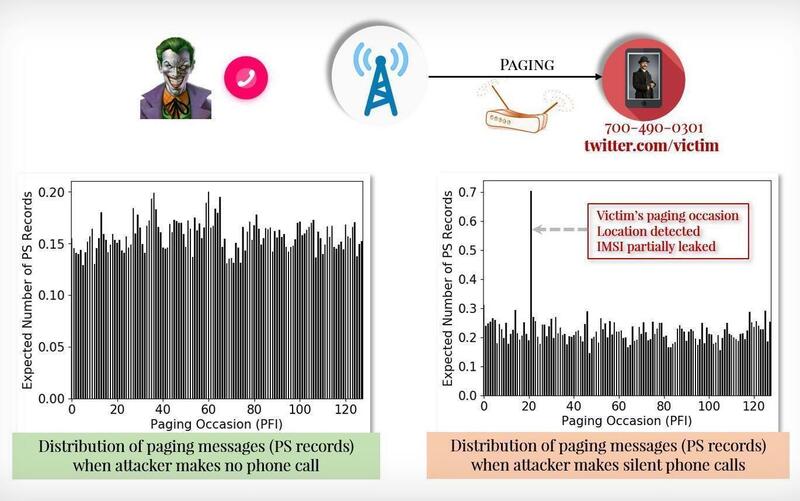 Knowing the victim’s paging occasion also lets an attacker hijack the paging channel and inject or deny paging messages, by spoofing messages like Amber alerts or blocking messages altogether, the researchers say. Torpedo opens the door to two other attacks: Piercer, which the researchers say allows an attacker to determine an international mobile subscriber identity (IMSI) on the 4G network; and the aptly named IMSI-Cracking attack, which can brute force an IMSI number in both 4G and 5G networks, where IMSI numbers are encrypted. That puts even the newest 5G-capable devices at risk from stingrays, said Hussain, which law enforcement use to identify someone’s real-time location and log all the phones within its range. Some of the more advanced devices are believed to be able to intercept calls and text messages, he said. According to Hussain, all four major U.S. operators — AT&T, Verizon (which owns TechCrunch), Sprint and T-Mobile — are affected by Torpedo, and the attacks can carried out with radio equipment costing as little as $200. One U.S. network, which he would not name, was also vulnerable to the Piercer attack. We contacted the big four cell giants, but none provided comment by the time of writing. If that changes, we’ll update. Given two of the attacks exploit flaws in the 4G and 5G standards, almost all the cell networks outside the U.S. are vulnerable to these attacks, said Hussain. Several networks in Europe and Asia are also vulnerable. Given the nature of the attacks, he said, the researchers are not releasing the proof-of-concept code to exploit the flaws. It’s the latest blow to cellular network security, which has faced intense scrutiny no more so than in the last year for flaws that have allowed the interception of calls and text messages. Vulnerabilities in Signaling System 7, used by cell networks to route calls and messages across networks, are under active exploitation by hackers. While 4G was meant to be more secure, research shows that it’s just as vulnerable as its 3G predecessor. And, 5G was meant to fix many of the intercepting capabilities but European data security authorities warned of similar flaws. Hussain said the flaws were reported to the GSMA, an industry body that represents mobile operators. GSMA recognized the flaws, but a spokesperson was unable to provide comment when reached. It isn’t known when the flaws will be fixed. Hussain said the Torpedo and IMSI-Cracking flaws would have to be first fixed by the GSMA, whereas a fix for Piercer depends solely on the carriers. Torpedo remains the priority as it precursors the other flaws, said Hussain. The paper comes almost exactly a year after Hussain et al revealed ten separate weaknesses in 4G LTE that allowed eavesdropping on phone calls and text messages, and spoofing emergency alerts.